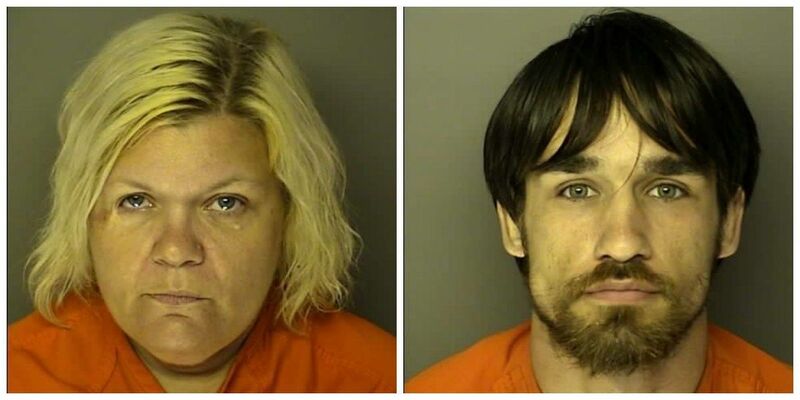 HORRY COUNTY, SC (WMBF) – An Horry County mother and her boyfriend were arrested, and their children were placed in protective custody after officers found their home filled with piles of trash, animal waste, various insects, animals in poor condition, and an "unbearable" odor, according to a police report. The children, who were reportedly covered in bites and sores and appeared to be dirty, were taken into emergency protective custody. Jenny Lynn Paradis, 43, and 22-year-old Joshua Palmer Vaught, described in the report as Paradis' boyfriend, were taken into custody Monday and each charged with two counts of unlawful neglect of a child, according to jail records. Paradis was also charged for mistreatment of animals. Horry County Police responded to their home on Enterprise Road, west of Socastee, after receiving a report of suspicious activity, according to a police report. A Department of Social Services representative requested officers conduct a welfare check due to reports of a strange odor that was possibly drug-related. When officers arrived, they spoke to Vaught and a neighbor, who appeared to be removing bags of trash from the home and putting them in a truck, the report states. Vaught said he lived in the home with Paradis and her two children. The neighbor contacted Paradis to ask to her to return with her children. While waiting for Paradis to return, officers checked the home to determine if it was suitable for children to be living there, the report states. On the porch, there were piles of trash with maggots and a large pile of cat litter that contained feces, according to officials. There were several cats walking freely in and out of the home through a hole in the kitchen window. There was no air conditioning in the home. Inside the home, officers noticed that the floor was covered in animal urine and feces, and the house was "full of various insects." There were also several animals in poor condition, including a pit bull, a wild squirrel, and a cat with an infected wound on its head. The kitchen was filled with dirty dishes, was covered in bugs, and there was trash everywhere, the report continues. There was no floor space or bed space visible in the bedroom where the children slept, due to dirty clothes and trash, officers noted in the report. "The odor was unbearable," the report states. Palmer told police that he and Vaught had been living in the home with the children in those conditions since October 2017. When Vaught returned to the home with the children, she agreed that the children should not be living there, but that she "just didn't feel like cleaning due to being tired." The officer then noticed that the children were covered in bites and sores and appeared to be dirty. There were apparently bed bugs and possibly fleas in the home, the report states. The children told officers that they do bathe, but "sometimes the bathroom is full of spiders." One child told officers that he tries to help his mom clean the house. The report noted that he was wearing Vaught's adult-sized shoes because he didn't have any. "At no point during the six months of living in these conditions did [Paradis and Vaught] attempt to resolve the issues or request assistance," the report states. A DSS representative responded to the scene. The children were taken into emergency protective custody and transferred to DSS for placement elsewhere. DSS also said they planned to get the children medical treatment. Paradis and Vaught were taken into custody, and another officer responded to take custody of the animals in the home, the report states. It was determined the animals were not properly taken care of and were not up-to-date on vaccinations.